Nearly 2,100 people have been killed and injured in 173 attacks in Afghanistan in April showing 15 percent increase in casualties happened in April compared to March. According to Pajhwok Afghan News daily reports 1,018 people have been killed and 792 others injured in 171 different attacks in 31 provinces of the country in March. On average, 54 people were suffering casualties on daily basis during the first four months last year compared to 61 people during the same period this year. 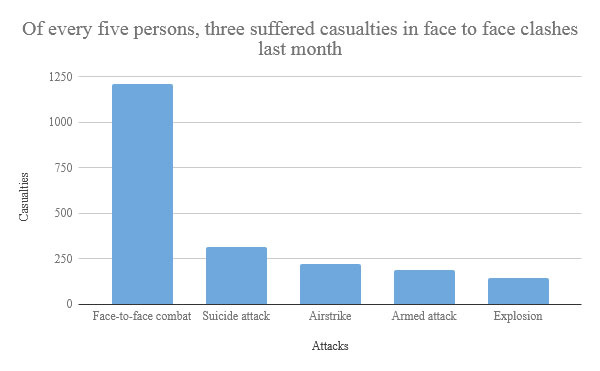 The figures show that the level of casualties is increasing this year compare to the last. Last year, 25,000 people suffered casualties in Afghanistan. Reports based on different sources showed 1,220 people were killed and 866 others injured in 27 out of total 34 provinces of the country during April. Statistic showed that in April of every 15 people, eight people suffered casualties in face to face fighting, two in airstrikes and one each in targeted attacks and blasts. More than half of the April attacks took place in Faryab, Nangarhar, Ghazni, Jawzjan and Kunduz provinces and the remaining attacks happened in 25 other provinces while Pajhwok had no report of violent incidents from Bamyan, Nuristan, Panshir, Paktia, Nimroz, Takhar and Nuristan provinces. Political affairs expert Javed Kohistani said more attacks had been taking place in Nangarhar because the province has border with Pakistan and the Daesh insurgents were more active in the province. In Jawzjan and Kunduz, he said the lack of attention from the government, ethnic differences and public disappointment had caused insecurity and provided the chance for insurgent to penetrate. He added due to above problems insurgents had been more active in these province and where rebels have presence security forces conduct more operations. Officials of the Ministry of Defence (MoD) acknowledged they conduct more operations in the areas where militants have presence. Reports showed that last month 1,220 people were killed and 866 others got injured. Among the dead and wounded were rebels, security forces and civilians, but Pajhwok could not share separate and exact number of dead and injured of each category because different sources shared different views. Blasts and casualties happened on daily bases in April but the most deadly day was April 22. On this day 97 people were killed and 136 others injured. The deadliest incident happened on voter registration centre in Dasht-i-Archi in which 69 people were killed and 210 others injured. Daesh claimed responsibility for the blast. 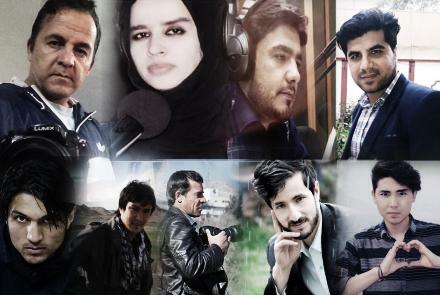 At least 25 people including nine journalists were killed and 45 others including seven journalists wounded in two separate attacks claimed by Daesh or Islamic State (IS) in the capital Kabul on April 30. Four other attacks including one on Tazkera distribution center happened in Kabul on April 22. A military affairs expert, Gen. Zalmai Wardak, said that different casualty figures in different areas depended to the conflict type and tactic. He said that front wars cause more casualties in populated areas such as in Kabul. The conflict in Afghanistan between the Taliban militants and the Afghan government and international forces is ongoing form the past 17 years. Pajhwok monthly reports show that militants’ attacks were more frequent and there were more casualties in spring and summer compared to fall and winter last year. Casualties’ figures show that current year is more violent compared to the last year. He said Afghans were killed under different names in their country while the benefits were sent to others. Stanikzai asked the Afghan government and militants to reach a peace agreement and put an end to the killing of Afghans. According to the CNN/ORC survey of 1,035 adults nationwide, 82 percent said they oppose the conflict in Afghanistan, up from 46 percent five years ago.